Cold brew coffee makers come in all shapes and sizes and boy, are they cool. Here I was thinking mason jars were only good for collecting loose change or canning tomatoes! They also make it easy to brew cold brew coffee, and you’ll feel like a hipster while doing it. That’s not all, there are pitchers, and toddy’s, and kettles (oh my!) that make it easy and dare I say fun to brew coffee. Today I will help you find a cold brewer by reviewing three of the most popular models. My review is based on what the industry experts recommend when cold-brewing, and reviews from Amazon verified purchasers that I call my coffee brigade. They are my virtual band of caffeinated cohorts that love coffee almost as much as I do, and recommend the best brewers to try, and more importantly, the ones to avoid. Are you ready to start cold brewing? Let’s find the best coffee makers for cold brews! Is Toddy a Good Match for You? For anyone of a certain age that have fond memories of clear jars with “Ball” scrolled on the outside, this is cool. It’s the same mason jar your grandma had on her counter, but now it does oh-so-much more than just hold tomatoes or sweet tea. It makes it easy to brew, store, and drink cold brew coffee. If you have never seen a typical Ball mason jar, it has three parts: the glass jar, and a 2-piece metal lid that features a removable center and metal rim. Now the question is, how does it work? Would you like wordy play-by-play or would a thoughtful infographic work instead? That’s what I thought; thanks to its manufacturer, here’s a quick illustration of how it works. It really can’t get much easier than that: you place the filter in the mason jar, allow 14-16 hours to brew, and then discard the grounds. Do you want to know why the famous Ball Mason Jar was chosen by Country Line Kitchen as its jar of choice? It’s because the Ball Mason Jar has proven to be durable and reliable, its soda lime glass is impenetrable keeping unwanted aromas from entering the brew when sealed, and the glass has been proven to withstand harsh temperatures and rough handling while canning. The Ball Jar makes it a novelty, the filter and top make it a brewer. This cold brew coffee maker comes with a stainless-steel filter that holds the grounds allowing the grounds to steep and bloom during the cold brew process. This filter is easy to clean, dishwasher safe, and boasts high-quality, BPA-free materials. It’s engineered from food grade stainless-steel and allows a 1:3 coffee to water ratio giving you a strong cup of cold-brew coffee that you can easily customize to suit your taste. The Coffee Brigade likes that this filter doesn’t have sharp edges and that you can order replacement filters as needed for a reasonable cost. Topping off this brewer is a stainless-steel lid with a silicone seal. The seal ensures a tight seal while brewing, keeping unwanted odors out and preventing a spill should the jar tip. For those that want to use the mason jar to brew and to drink your cold brew, reCAP has engineered a wide-mouth canning jar lid. 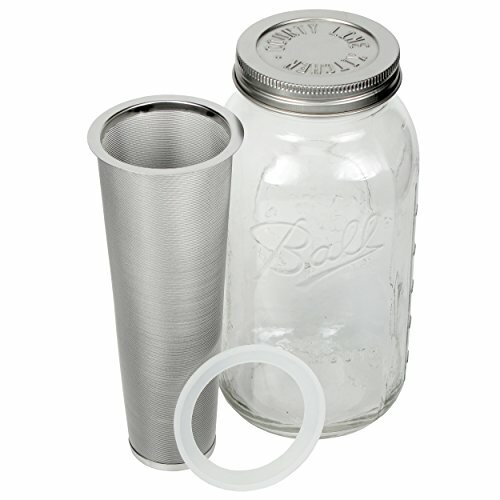 Now you can pour or drink right from the jar after discarding the grounds which is neat. In general, the Coffee Brigade loves this cold brew jar, giving with 1,838 reviewers giving it an average score of 4.8/5-star rating because it’s easy to use and makes a great cup of cold brew. Is This Cold Coffee Brewer the Right One for You? If you want a simple way to brew cold brew, or your fridge is roughly the size of your microwave (looking at you, college kids) this brewer is the one for you. It is reliable, compact, affordable, and gets the job down in style. 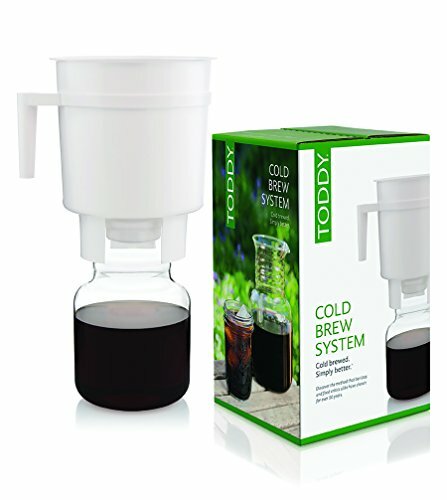 The Toddy Cold Brew System is designed for coffee drinkers that thirst for the best cold brewing experience, and are willing to put in a little bit of work for cold brew that will last for weeks. A Cornell chemical engineering graduate named Todd Simpson (get it, Toddy?) developed this brewing method in 1964 to create a cup of coffee that was less acidic and easier for people with sensitive stomachs to drink. This cold brew coffee can be served hot or cold, and once brewed lasts two weeks in the fridge when sealed in its air-tight container. At first glance, you might think you set this brewer up as pictured above and wait for the delicious cold brew to drip down, much like an automated machine. That’s what I assumed, but I was mistaken; the actual brewing takes place in the white brewing container, and the glass carafe only comes in at the end when the coffee needs someplace to call home. It was the filter and the rubber stopper that intrigued me, especially since Amazon sells both separately. 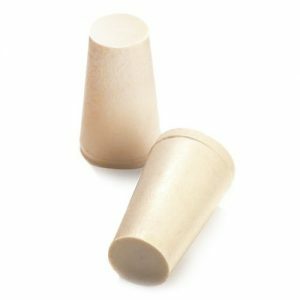 Coffee Brigade Says: The stoppers are sturdy and reliable, and they recommend having a few extra available in case one goes missing, or the stopper loses its elasticity over time. 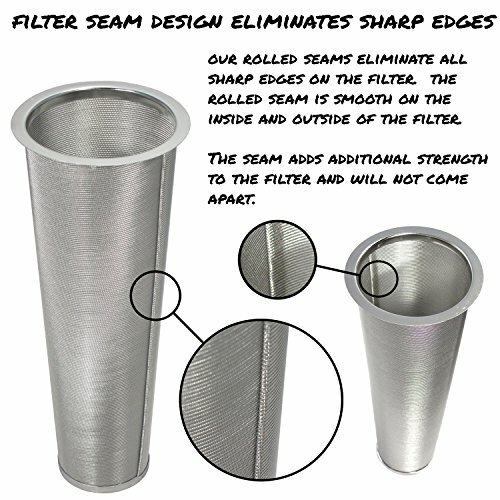 Coffee Brigade Says: These filters are easy to use, clean, and store and should only need replacing a few times a year. It made me wonder, just how involved is this process? It’s not too bad, especially considering after one brew you will have ten cups of coffee concentrate that can last for two weeks in the refrigerator. If you want to go-big-or-go-home, you can purchase the wholesale Toddy brewer which brews over 80 delicious iced drinks after one brew. Prepare the brewing container by placing the stopper in the bottom of the unit. Soak the felt filter in water and then place it the bottom, pouring one cup of water over the filter to avoid having grounds sticking to it. When brewing 12 ounces of coarse ground coffee, pour half, or six ounces, of grounds in the container and cover with three cups of water. Pour in a circular motion to ensure all grounds are saturated. Wait five minutes and then add the rest of the coffee. Add three more cups of water using a circular motion and once full, use a spoon to push down any grinds on the side of the maker to make sure all are wet. Hold the brewer directly over the glass decanter and remove the stopper to release the brew. Rest it on top of the carafe and allow all the coffee to drip from the container. Place the air-tight lid on the carafe and place in the refrigerator for up to two weeks. It seems like a lot of work for a cup of coffee for those of us used to automated brewers, but really, it’s not that bad seeing you will brew enough to last all week. 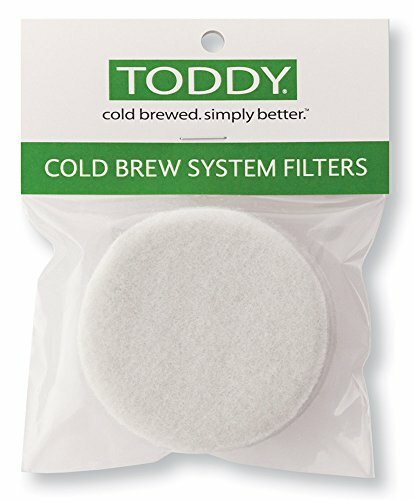 The Toddy Cold Brew System received mostly positive reviews with an average score of 4.5/5 stars based on 1,201 Amazon reviews. The biggest complaint from the more critical reviews was about how the stopper can be difficult to remove and loses its elasticity over time, and that the felt filter can be hard to clean. Remember how I was intrigued by the replacement stoppers and filters for sale on Amazon? Now I realize it’s these two parts of the Toddy system that people either tolerate or hate, but as a potential buyer, it doesn’t make me less inclined to buy. Overall, there were not many reviewers complaining about the taste of the brew with even some of the more critical reviews conceding that they had no issues with the taste, just the mechanics of the system. 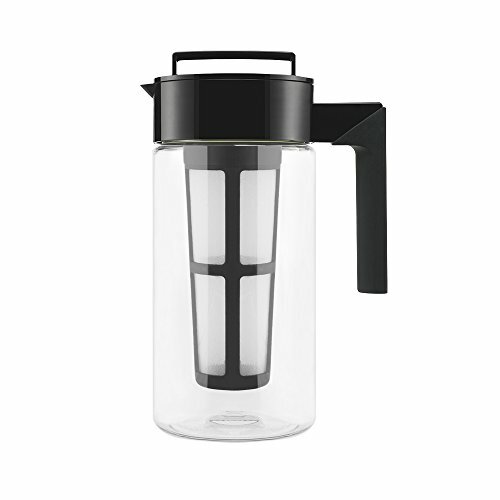 If you are a “one and done” kind of person that wants to make their coffee for the week, keep it in the fridge, and grab it on-the-go, the Toddy Cold Brewing System is a good fit for you. When served hot or cold, a Toddy cold brew cup gives you a less acidic, smooth cold brew cup in the comfort of your home. Thanks to its compact design, this brewer looks more like a pitcher of juice that typically resides in that quick-access spot usually reserved for milk and juice. This is what makes this brewer stand out from its other cold-brewing competitors: it offers sleek design with an airtight seal that makes it easy to brew and store. The Takeya Cold Brewer is super simple to use, clean, and store. To brew, put 14-16 tablespoons of coarsely ground medium roast coffee in the infuser and twist the lid encapsulating the grinds. Then, add 32 ounces of cold, filtered water to the pitcher, place the infuser into the water, and twist to seal the lid. Shake well and store it in the refrigerator overnight or up to 36 hours to brew, occasionally twisting open the infuser to swirl the brew. If you prefer a stronger cold-brew cup, allow a longer time to steep; for those new to cold brew, first, try up to 24-hours to brew and then adjust your next batch according to your taste. The more time you allow your grinds to steep, the stronger the brew. Once the allotted time has passed, remove the infuser, take the lid and seal the top of the pitcher to keep the flavor in and the air out, and then store it in your refrigerator for up to two weeks. It’s important to remember that when you brew using cold-brew coffee methods, you make coffee concentrate which is different from your regular drip-brew variety. To serve it hot, mix one-part coffee concentrate with two parts boiling water adding the desired cream and sweetener as you would a traditional cup. For iced coffee, combine the concentrate with water or milk adding sweeteners to create the right balance depending on your taste. After spending hours researching for this piece, I’ve decided the Takeya is the brewer for me. Based on what I have read from verified purchasers it is easy to use and clean and makes a great cup of coffee. I like the price, love the fact that I can pop it in the dishwasher, and the size is right for my fridge. The mason jar brewer is cool, but since it only brews a small amount I don’t think it will work for me. As for the Toddy, I don’t have the refrigerator space to accommodate the brewer, and I lack the coordination to remove a cork and not have it be a total mess. So really, I’m buying the Takeya Brewer because I’m cheap, I drink way too much coffee and I don’t want to wash it by hand. Great article but I see you said the County Line Kitchen Brewer only brews a little bit of coffee compare to the Takeya. But both the CLK and Takeya come in 1QT ad 2QT sizes. The article specified the 1QT Takeya… so even the small mason jar model should have made the same amount. No?